NatureStop: Painted Ladies at Kalbu Park. Painted Ladies at Kalbu Park. Kalbu Park is where we usually spend our evenings. Port,making it very pleasant in the evenings. As the sun sets, this is what we witness. mountain ,as if to say"now it's my turn". As dusk settles this is what Kalbu Park looks like. see Diya(our little daughter)trying to catch them. lantana to lantana and sometimes rested on the grass. What a beautiful place Kalbu Park looks. Love that golden sunset with the boat. We've had a large invasion of Painted Ladies here in th UK. Amazing to see so many of the beauties. What a fantastic Butterfly and a superb set of photo's. Love your photos, Shatana.. The park, the moon, the butterfliesl---EVERYTHING is gorgeous!! These are all beautiful photos - such a nice selection! Beautiful series of shots. The painted ladies are gorgeous. 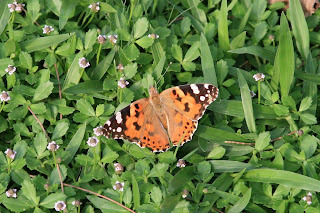 Painted Ladies in Kalbu Park and also here in the UK - a timely reminder that this is one Earth we all share. That's a great shot of the moonrise over the mountains. Hello Shantana, I think my previous comment was deleted...I just want to say how lovely it is to see where you spend your evenings. The views are amazing and your daughter must have enjoyed chasing the butterflies. Thanks for sharing such magical photos. What a great place to live! 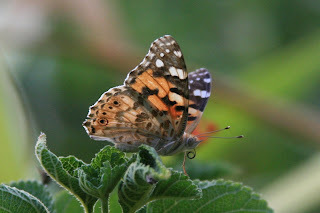 The butterflies have been to our gardens here in Ohio as well, spring is definately here! 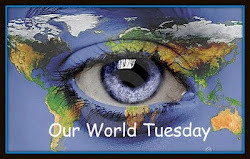 Great photos and mosaics on your blog. Nice blog with beautiful pictures. Hi Arunava and Shantana, Lovely blog! I foresee evenings slipping away while I explore more. Kalbu Park looks beautiful, especially at sunset, the lights on the water and the moon sneaking up behind. You captured it so well I can imagine walking there myself. You have some beautiful photos here. Kalbu park is gorgeous! I would love to have a place like that to spend my evenings. holdingmoments and Jenny, we just got to see the beauties only that particular day.Never saw them again.Envy you guys getting to se so many. Betsy, Shellmo,Magiceye,Elaine thanks for your comments.Much appreciated. Rambling Rob, thanks for visiting and do visit again. Mildred, glad that you enjoyed. David,Álvaro, Omi, France,thanks for visiting and your kind words.Do drop in again. Just been catching up with your latest posts, such lovely photos, what a beautiful place you live in. The Dune Bashing looked great fun but far too scary for me! You have done better than me, the 'invasion' of Painted Ladies has not materialised in my area, I have seen two or three fleetingly, but not long enough to get a photo. Hello Arunava and Shantana. Thanks for visiting my blog. You have wonderful pictures here too. It is very interesting to learn about other countries, their fauna and flora. What a wonderful place to spend your evenings :D I see the painted ladies have reached you too... Nice pictures and how lovely to have Lantana just growing wild! Great images. So this is where they have been hiding. I note that they have the pink shade on the wings which our new breed will have later on.